The 5-day RYA Day Skipper (Sail) course teaches pilotage, navigation, seamanship and boat handling up to the standard required to skipper a small cruising yacht safely by day in waters with which the student is familiar. The boats we use for training are all commercially coded and inspected by the RYA. The Boat School course to obtain the RYA Day Skipper (Sail) certificate is taught in small groups with a maximum of five students. The course lasts 5 days. Open group courses normally run from Monday to Friday. The Boat School’s RYA Day Skipper (Sail) course aims to provide aspiring skippers with the skills and confidence they need to take charge of a sailing yacht. The course focuses on developing the practical skippering skills of crew management, boat handling, practical pilotage and passage making. On successful completion of an RYA Day Skipper course, UK nationals and nationals of certain other countries automatically qualify for an ICC issued by the RYA. The ICC is widely recognised as evidence of competence in most European countries. Spanish law allows charter companies to rent sailboats to UK nationals or residents in possession of the RYA Day Skipper certificate; however, if you own your own boat (or you’re thinking of buying one), you will need to apply for the ICC. During July and August, we publish regular course dates and you can book the course directly online. For the rest of the year, we schedule courses in accordance with the availability of students interested in the course. The RYA Day Skipper course can be combined with other RYA courses in the sail cruising scheme. This means that you can choose a rental and course pack and have, for example, two participants preparing for the Competent Crew certificate and two students preparing for Day Skipper. If you already own a yacht, or if you have a friend who owns a sailboat, we’re more than happy to run an RYA Day Skipper course on your own boat. This option is significantly cheaper than open groups and charters; however, you do need to make sure that your boat is up to the standard required by the RYA for training. Before you book this course you should have some sailing experience on a cruising yacht. There are no qualification requirements, but it is recommended that participants are at least Competent Crew standard before taking the Practical course. Participants should have 5 days, 100 miles and 4 night hours on board a sailing yacht. The RYA Day Skipper qualification has two parts: the 5-day practical course and a 40 hour theory course. Holding a shorebased course completion certificate in not a prerequisite to attend this course, but it is essential that you have the same knowledge level as somebody that has completed the Day Skipper shorebased course. There simply isn’t the time to learn all the theory whilst putting it into practice. You can do the shorebased course with The Boat School either in the classroom or online. The minimum age for the award of the certificate is 16. You can do the course with family members under the age of 16; however, we will only be able to issue the RYA Start Yachting certificate or Competent Crew certificate to more junior participants. 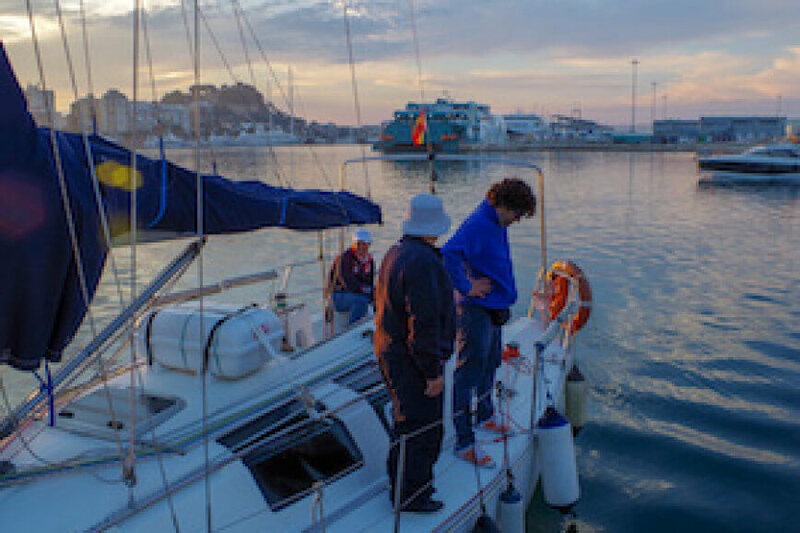 All year round, we run a minimum of two RYA Day Skipper practical sail courses from the Marina de Denia. Click on the Book Now button to check course availability and reserve your course. Please use the form below if you can’t find the dates you need or if you want to book a closed group course for family and friends.